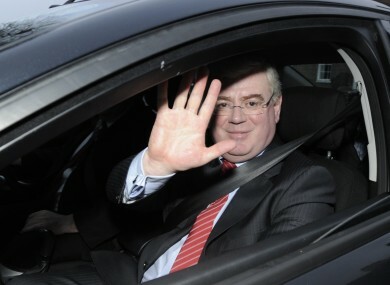 Eamon Gilmore is waving goodbye, but is he on his way to Brussels? FOR THE LAST few weeks Labour candidates for leader and deputy leader have been hearing many complaints from members that the party has’t been assertive enough in government over the past three years. The junior coalition partner is very much in transition at the moment with the leadership up in the air until Friday, but it’s already beginning to be assertive post its election bloodbath when it comes to the job of Ireland’s EU Commissioner. Outgoing Tánaiste Eamon Gilmore has let it be known that he wants the job having previously indicated he would be happy to retire to the backbenches once his replacement is elected and work on the considerable task of retaining his Dáil seat in 2016. Far more attractive now is the possibility of being one of the EU’s 28 Commissioners – a plum job with a sizeable wage, lots of prestige (if you get a good portfolio) and a chance to restore a reputation battered by his time in government. Several Labour ministers are throwing their support behind him with junior minister Joe Costello identifying him as having the “strongest credentials” for the job. For Labour this too is an opportunity to be more assertive in government by demanding that the commissioner role go to it and not Fine Gael whose minister Phil Hogan has been for sometime considered a shoo-in for the job. Indeed the commissioner post was seen as a reward for one of Enda Kenny’s most loyal lieutenant’s who saw off the attempted heave in 2010 and took the unpopular Environment Minister job that brought with it a storm of criticism and abuse over the household charge, septic tanks, the property tax, and water charges. Indeed at the height of Hogan’s unpopularity around two years ago there was almost a political imperative to dispatching him to Brussels, much like there was when Bertie Ahern sent Charlie McCreevy’s to Brussels in 2004 after the then finance minister dared to suggest the good times might be coming to an end. Now if the Commission job goes to Gilmore – or someone else – Hogan will be staying at home. Whether it be in Environment or elsewhere it is likely that the Carlow-Kilkenny TD will remain at Cabinet. He is after all a loyal servant to Kenny whose allies are diminishing with the departure of Alan Shatter in May and the likely demotion – either from Health or Cabinet altogether – of James Reilly. While the permutations for the Cabinet reshuffle are many and varied and almost impossible to call with any great degree of accuracy, it’s becoming increasingly clear that it will either be Hogan or Gilmore for the EU Commissioner job (an outside bet also being talked about is Fine Gael MEP Mairead McGuinness). Of course were Kenny to relent and give it to Gilmore, Fine Gael would expect a quid pro quo be it that Labour loses a plum Cabinet post or some concession in the Budget in October perhaps. But right now with Labour’s poll numbers in the single digits and the party having no representation whatsoever in the European Parliament it would be a boost to secure this position. It would also mark an early victory for the new leader of the party and if that is, as widely expected, Joan Burton then she might also prefer that Gilmore, her one-time rival, is away in Brussels rather than loitering on the backbenches for the next 18 months or so as she attempts to rebuild the party. Email “Why Eamon Gilmore wants a top EU job, and why it would be a win for Labour if he got it ”. Feedback on “Why Eamon Gilmore wants a top EU job, and why it would be a win for Labour if he got it ”.